Yulie, you did an amazing job photographing our wedding! We could not be any happier with our pics, not only from our engagement session but also from our wedding. We picked Ulkare after seeing the amazing job you did wiht my best friends wedding, I knew that I had to hire them to photograph our wedding. I am having such a hard time picking pictures to print out to fill the empty picture frames in our new home. They are all so beautiful, it is hard to pick just a few. Thank you for capturing our very special day! Yulie did an exceptional job. She is extremely professional and has an artistic eye that allowed her to capture pictures that truly represent what that day was about. My husband and I are so very pleased with her work. I highly recommend her for any special event. We had ULKARE Photography capture our wedding day moments. It was a blast!!! Yulie and Dan were on top of thing directing us for the portraits but then let us enjoy the ceremony and the party photographing in reportage style. The photographs are FANTASTIC!!! Each and every image is edited, the selection and editing is very tasteful and highly artistic. We now try to make our selection for the album that is hard as I guess we want all 500 photos in there. Our photos are amazing. Yulie and Danilla are wonderful photographers and people. We did our engagement and wedding photos with them and the pics are so gorgeous. We have gotten nothing but compliments on our beautiful and creative photos from family and friends. They listened to our ideas and together I think we worked great! I would highly recommend them to anyone not only for wedding but any special occasion. The value you get in terms of time they spend with you, responsiveness, speed at getting your photos back (lightning) and quality is AMAZING. Thank you Ulkare for giving us wonderful memories to keep. I was a picky bride. What I wanted was something more than just the standard poses you always see from a wedding. I wanted more natural, out-of-the-blue, action shots. And they totally exceeded my expectations!! Not only were the pictures fantastic, but the value was amazing, and they literally had my wedding pictures ready for me within 2 weeks!!! Unbelievable Service!! Would recommend them to anyone! Yulie and Dan were our wedding photographers. But before we got to that point, we had an engagement photo shoot with them. This shoot was to test the waters, see how things went and find out if they were the right photographers for us. They were amazing! The shoot was fun and exciting. We had such a great time we all lost track of time. The engagement album was perfect. It was just what we envisioned. From the time we had our engagement session to the wedding itself, they were professional and exceeded our expectations at every turn. 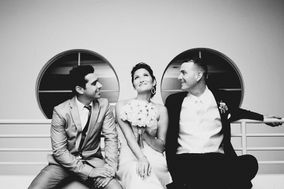 Your photography for your wedding is one of the most important decisions you will make about your wedding and you can't go wrong here. If I had to do it over again, I would pick them again and again. I just had my wedding at the end of April and Yulie took wonderful photos! She was very professional, gave great pose ideas, and communicated before and after my wedding wonderfully. I have had so many complements on my photos since I received them! If you go with Ulkare you will not regret it!